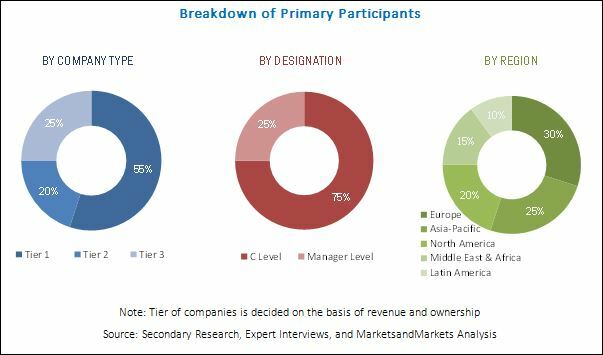 [148 Pages Report] The global industrial dryers market was valued at USD 4.00 Billion in 2015 and is projected to reach USD 6.37 Billion by 2026, at a CAGR of 4.3% from 2016 to 2026. The research methodology used to estimate and forecast the global industrial dryers market began with capturing data on key vendor revenues through secondary research from secondary sources such as Hoovers, Bloomberg, Chemical Weekly, Factiva, and various other government and private websites. The vendor offerings have also been taken into consideration to determine the market segmentation. After arriving at the overall market size, the total market was split into several segments and subsegments, which were later verified through primary research by conducting extensive interviews with key personnel, such as CEOs, VPs, directors, and executives. Data triangulation and market breakdown procedures were employed to complete the overall market engineering process and arrive at the exact statistics for all segments and subsegments of the market. The breakdown of profiles of primaries is depicted in the figure below. 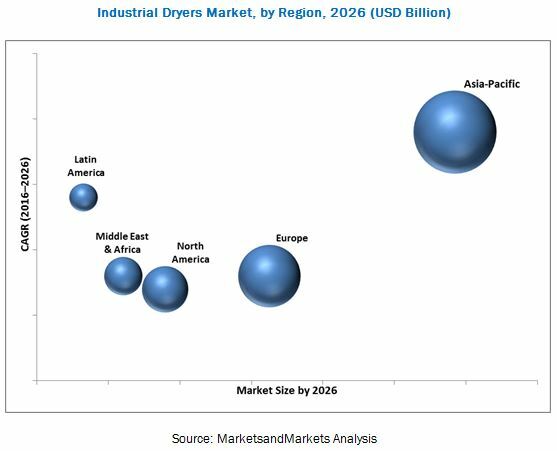 The global industrial dryers market has a diversified ecosystem of upstream players, including raw material suppliers, along with downstream stakeholders, vendors, end users, and government organizations. Companies operating in the global industrial dryers market include ThyssenKrupp AG (Germany), Andritz AG (Austria), GEA Group (Germany), Metso Corporation (Finland), FLSmidth & Co. A/S (Denmark), Buhler Holding AG (Switzerland), ANIVI Ingeniería SA (Spain), Carrier Vibrating Equipment, Inc. (U.S.), COMESSA (France), and Mitchell Dryers Ltd. (U.K.), among others. Scope of the Report: This research report categorizes the global industrial dryers market on the basis of product, type, application, and region, forecasting revenues as well as analyzing trends in each of the submarkets. Further breakdown of the Rest of APAC and Rest of Europe industrial dryers markets. Detailed analysis and profiling of additional market players (up to five companies). The global industrial dryers market was valued at USD 4.00 Billion in 2015 and is projected to reach USD 6.37 Billion by 2026, at a CAGR of 4.3% from 2016 to 2026. This growth is mainly attributed to the increasing demand for industrial dryers from various end-use industries such as food, pharmaceutical, chemicals, fertilizer, cement, minerals, and paper & pulp. Industrial dryers are equipment that can efficiently process large quantities of bulk materials which need reduced moisture levels. This helps several industries to meet their drying requirements. The direct dryers segment accounted for the largest share of the industrial dryers market in 2015 owing to the steep increase in their usage across several industries owing to their simple functionality and efficiency. Among all applications, the food segment holds the largest market share, in terms of value, as of 2015. There is a high demand for industrial dryers from the food industry. The food industry uses industrial dryers on a large scale to dry raw materials before they can be processed and converted into final products. The food industry typically uses industrial dryers for drying products such as dairy (milk, whey, creamers), coffee, coffee surrogates, tea, flavors, powdered drinks, processed cereal-based foods, potatoes, starch derivatives, sugar beet pulp, fruits, vegetables, and spices. The food industry uses dryers such as spray dryers and fluidized bed dryers to meet its requirements. The Asia-Pacific region accounted for the largest share of the industrial dryers market in 2015, and is expected to continue its dominance till 2026. China, India, and Japan led the Asia-Pacific industrial dryers market in 2015. The industrial dryers market in China is projected to grow at the highest CAGR among all countries in the Asia-Pacific region between 2016 and 2026. The factors inhibiting the growth of the industrial dryers market are unstable market and economic conditions. Apart from this, stringent environmental regulations also act as a challenge for the industry. Agreements such as that of BREXIT, which will lead to the U.K. moving out of the European Union, will also impact the drying equipment industry, as most of the exports of the U.K. are to the countries in the European Union due to the free trade agreement. Key market players operating in the industrial dryers market, such as ThyssenKrupp AG (Germany), Andritz AG (Austria), GEA Group (Germany), Metso Corporation (Finland), FLSmidth & Co. A/S (Denmark), Buhler Holding AG (Switzerland), ANIVI Ingeniería SA (Spain), Carrier Vibrating Equipment, Inc. (U.S.), COMESSA (France), and Mitchell Dryers Ltd. (U.K.), among others, have adopted various strategies to increase their market shares. Agreements, new product developments, expansions, and acquisitions are some of the key strategies adopted by market players to achieve growth in the industrial dryers market. 12.9 Carrier Vibrating Equipment, Inc.